I'm pedaling and hiking about in Hokkaido while this old favorite of mine, courtesy of Kitchen Garden Japan, goes live. The cucumbers at our farm are well done, but I know there are still plenty to be had at farmers markets across the city and beyond. And surely it's still hot enough to warrant a chilled dish served up with a cold glass of something like...beer! 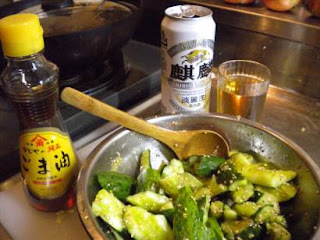 A cold beer and cold cukes: a masterpiece from Kitchen Garden Japan. Cucumbers are in full swing as well, and seem to be nearly taking over just about every vegetable stand in the area. I usually serve them straight up or with miso for dipping. Well, thanks to Kitchen Garden Japan (KGJ) and this nifty little recipe we've just added another dish to our standard summer fare. (Tom recommends serving them with beer, so we followed suit.) Tweaked a bit to match what was on hand plus some creativeness - paprika, sesame seeds, and a dash of soy sauce - we finished a big bowl in no time. I feel cooler already. And this time, here's the recipe! Chill cucumbers thoroughly. After chilled, place cucumber on cutting board or other surface. Place left hand on right hand (or other way around as you're comfortable), and using the ball of your hand push down to crush open the cucumber. As KGJ says, this creates more surface area for those lovely additions listed above to adhere to when the time comes. Then, tear the cucumber into bite size pieces. Plop these into a bowl, drizzle over the assorted ingredients above, stir, taste, and repeat until there's a flavor you love. (Try not to eat the entire bowl in the process, please.) Open the cold beer, and settle in to eat from the bottom of the bowl. For those secretly thinking slicing will be just fine, let me just say that I've tried it. It might look tidier, but KGJ is right on the money when he says the flavors adhere better. Just be messy for once and enjoy yourself. Small zucchini also work here, although they are denser. Do visit Tom over at Kitchen Garden Japan, too, for good writing, great recipes, and insight into life lived much further south of here with a family of four and a little farming thrown in for good measure. You won't regret it.